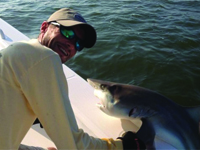 Catch the big one when you venture out on the high seas with a St. Simons charter boat captain. The waters surrounding St. Simons Island are teeming with game fish – the lure for the saltiest of seasoned anglers. Or try your hand at offshore fishing and venture out in the Gulfstream waters in search of marlin, tuna and other trophy fish. Closer to shore, visitors can enjoy a range of signature St. Simons watersports, from surfing to parasailing. Don’t miss all the fun!